In the second part of our NAMM 2012 coverage we go deeper with Moog Music, Akai, and Buchla to get the inside scoop on some hot new music products. In addition we explore some new gear and videos from Waldorf, SONiVOX, Mackie and Kurzweil. One piece of gear that is stealing everyone’s attention right now is Moog‘s new Minitaur bass synthesizer. It’s a monophonic synth based on their classic Tarus bass pedals that boasts USB / MIDI connectivity, one knob per function and very small footprint for $679 ($599 street). In this video Nick from Moog Music explains the history behind the new Minitaur tabletop bass synthesizer and gives a demonstration of what it can sound like. Akai‘s big hit this year seems to be the MPC Fly – a combination iPad case with MPC pads and application that re-create the MPC workflow on your iPad. While the unit was not yet in production for us to try out, we did get to look at the software that will support the MPC Fly. Buchla creates modular analog synthesizers that have been championed by artists such as Trent Reznor and Richard Devine. In this video Ezra Buchla (son of company founder, Don Buchla) explains some of the sequencing capabilities of the highly coveted Buchla modular instrument. Everyone seems to be going analog again and legendary synth creators Waldorf are no exception. 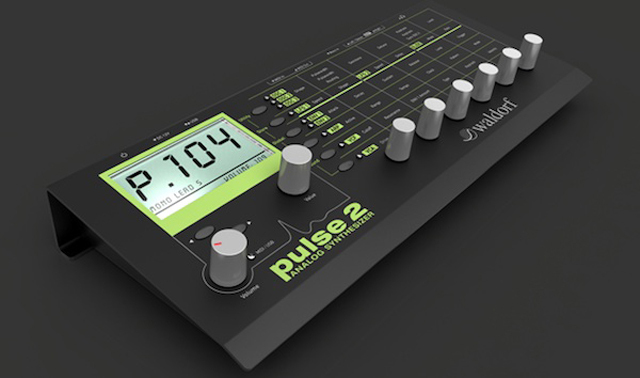 Following up on their 1996 Pulse instrument comes a revamp in the form of Pulse 2. The new monophonic synth has three oscillators, a filter, an 8-slot modulation matrix, an arpeggiator, and is backwards compatible with the original Pulse. The Pulse 2 releases this summer. On the software end of things, one product that stood out was SONiVOX‘s Wobble dubstep grime generator. Wobble combines SONiVOX’s new spectral morphing synthesis technology with a bevy of intuitive realtime performance features. Wobble is designed to make the most crazy, pulsating, and different sounds ever to grace your speaker’s soon to be aching cones. First of all, this is one of the strangest advertisements we’ve ever seen as Mackie and the sound guy for Portland band Vanimal get surreal in this very trippy video. Simultaneously the product being advertised looks incredibly cool. Mackie explains: The Mackie DL1608 is a full-featured digital mixer with the mobility of an iPad. With 16 Onyx mic preamps and 24bit Cirrus Logic AD/DA converters, you have unparalleled sound quality. Seamless wired to wireless iPad control means you can mix from anywhere in the venue. The Kurzweil PC3 Series of workstations (and Kurzweil keyboards in general) are a standard in music performance. They’re not entry level instruments and they often cost well over two thousand dollars to acquire. But these instruments continue to set the standard for performance keyboard / synthesizers. In this new video, Ray Kurzweil recalls the story of Stevie Wonder’s technical challenge that ultimately motivated the inception of Kurzweil Music Systems.